Amidst all the things in the US economy that aren’t going in the right direction, the debacles, fiascoes, and nightmares, is an industry of scrappy upstarts, tiny operations, and larger companies that use American ingenuity, marketing, and the right amount of hops to stand up to Wall-Street-engineered giants. 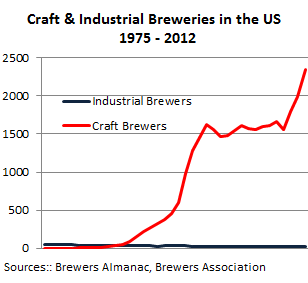 Beer is one heck of a tough industry in the US. Production peaked in 1990 and has since receded in small increments despite the enormous marketing efforts and Super Bowl ads by the largest brewing empires the word has ever seen. 2012 was a rare up-year, with a growth of a whopping 0.9%. 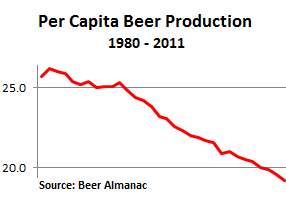 But the growing population over those two decades has covered up an industry horror: per-capita beer production has fallen, according to the latest Brewers Almanac, from 26.2 gallons in 1982 to 19.2 gallons in 2011 as people switched from beer to wine. 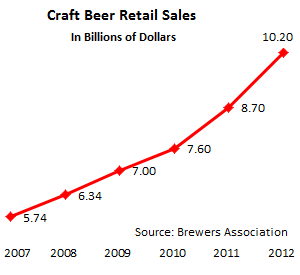 But there is one subgroup in the $99 billion industry that is doing phenomenally well: craft brewers. In an economy that was stumbling along in 2012, they booked 15% growth by volume and 17% by dollars, according to the Brewers Association. Their market share in 2012 reached 6.5% by volume—up from 5.7% in 2011. It’s coming out of the hides of the big guys. In retail dollars, their market share grew to 10.2%, the first time ever in the double digits. The higher market share in dollars is a result of their strategy to sell a premium product for a premium price. And people are buying it! “High quality, flavor-forward” is how Paul Gatza, director of the Brewers Association describes these brewskis. Craft brewers employed 108,440 people by the end of 2012 and created 4,857 new jobs. For the first time, sales broke through the $10 billion mark. And they’re flexing their new muscles abroad: in 2012, export volume jumped 72%, to well, $49 million. Okay, tiny muscles. Less than 0.5% of the craft beer sold in the US, and barely noticeable in the overall scheme of things. It’s not going to reverse the US trade deficit anytime soon. Canada is the largest export market, with Sweden and the UK in second and third place. 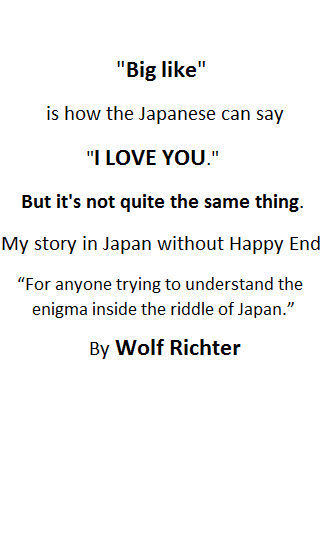 And shipments to Japan jumped 57%. Every little bit counts. Breweries are popping up at a rate of over one a day! By the end of last year, 409 new breweries—310 microbreweries and 99 brewpubs—were in operation. But it’s not a laid-back affair. In addition to being able to brew good beer, they also have to be able to stay alive as a business. Not all did: 43 breweries shut down. So, by year end, a total of 2,347 craft breweries were in operation (1,132 brewpubs, 1,118 microbreweries, and 97 regional craft breweries). Almost all of them were closely held. Back in the day before refrigeration, when beer didn’t last long and was difficult to transport across long distances, every town worth its salt had a brewery. The Brewers Almanac, whose data series goes back to 1887, recorded 2,269 breweries that year—the highpoint in the series. By 1918, the brewery count was down to 1,092. In 1920, after the prohibition kicked it, it was zero. But in 1933, suddenly 331 breweries popped back up. By 1941, there were 857, and that was it, the second peak. With more efficient transportation, refrigeration, and industrial production, the industry consolidated into giants—57 by 1975. But a change was underfoot: among these 57 was 1 craft brewery. Now the industrial giants are down to 20. Three multinational corporations own most of them: InBev in Brazil, SABMiller in the UK, and Molson Coors Brewing Company in Canada. Pabst Brewing Company is still independent. And in 2012, they continued to lose market share. But these 2,347 tiny craft brewers that have now pushed the brewery count beyond the 1887 high of recorded beer history keep winning the hearts and taste buds of American consumers. An incredible feat in our crazy times of financial engineering, outsourcing, and off-shoring. Their small-scale production is no longer just carving out a niche; it’s winning the large-scale beer war against the giants. Because their products rock!